What is Gear Up Day? It’s the official launch of the 2013 Enbridge Ride to Conquer Cancer campaign. Next spring, on June 8-9, 2013 I will be riding in support of the Princess Margaret Hospital cancer research centre for the 6th time! It will be my 3rd ride since my own battle with cancer. Once again I am glad to be riding as the captain of Team Kortright. What I’m not so glad about is that this year, as in every year previously, the number of people the team is riding for has increased. It can be disheartening to see more and more of our friends and family are being afflicted with this disease. But like them, we ride on, because giving up isn’t an option. They continue living on relying on friends, family and faith to get them through. The most recent of these is my friend Cindi Olsen whose victory over cancer is being chronicled by her husband Pete over at their blog – Following Jesus is Hard. And so, once again I appeal to all of you to support Team Kortright and I as we continue to do our part in the fight against this disease. You can donate online by clicking on the banner on the left side of your screen and checking out my Ride Page. 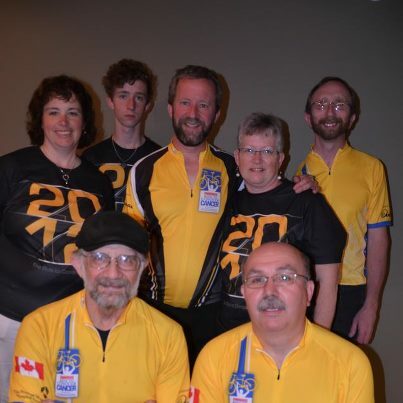 While there you can also join Team Kortright by clicking on the “Join Dennis’ Team” button. Sign up and be a part of what is always an amazing adventure. If you want a look at what the ride is like check out the previous posts by clicking on RtCC in the tag cloud. I’d like to thank you all in advance for your support as we continue to seek the goal of conquering cancer in our lifetime! Well, it’s been over a week and I am only just now getting around to posting about how the Ride to Conquer Cancer went this year. Gives you an idea how hectic my week has been. That said, the Ride went just great! We all had a good time; endured some rain, met a few challenges, found new friends, sweltered in the heat, ate food, drank beer, rode a lot of miles. Team Kortright did very well raising $19,000 out of the $18.1 million raised by the collective 4,852 riders. It was all I expected it to be and then some. There was one thing however that I did not expect. At lunch the first day a guy with a video camera comes up to my brother Alex and I and asks us a few questions about why we were doing the Ride to Conquer Cancer. It’s not unheard of; it happened to me back in 2008, the first year of the Ride. They talk to a lot of people and then spend several weeks going through the footage and putting together the promo videos for the next years Ride. There is a ton of footage that is taken but never used, so it wasn’t that big a deal. What happened the next day however, was something different. At lunch on Day 2 the same guy spots us from across the lawn and calls out to us. He comes over and I remind him that he already spoke to us the day before. He says that’s why he’s looking for us again. He liked the footage so much and said we had such good presence that he wanted us to record a couple of scripted sound bites for use in the promos. Right now I can’t remember exactly what we said, but he spend about 10-12 minutes taping us delivering a couple of catch phrases and an invitation or two. 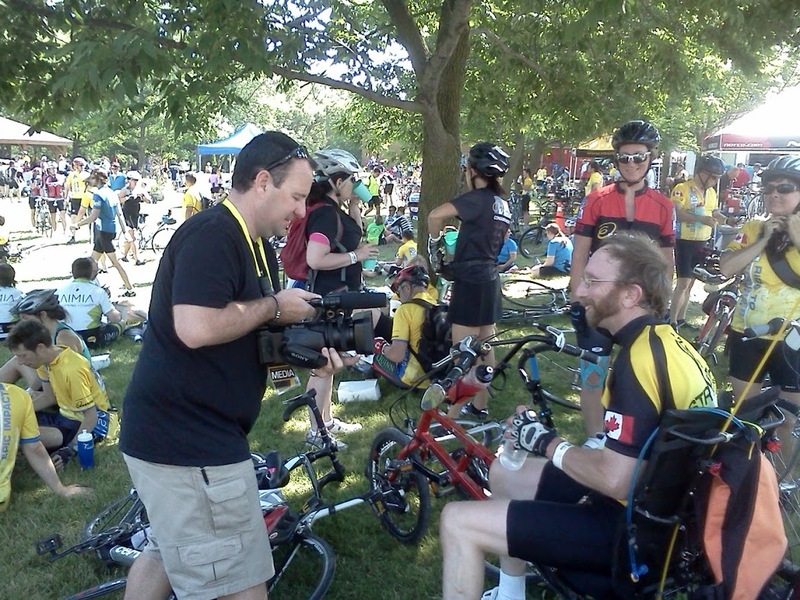 My brother Alex being Interviewed by video promo guy during the Ride to Conquer Cancer 2012. Alex was thrilled, grinning from ear to ear. And the video guys seemed to find him the more appealing of the two of us, of which I’m glad. I had my moment in the sun back in 2009 when I found myself part of the promo videos. I got calls from friends right across the country saying they had seen me in one or another of the ads. This year it is Alex’s turn and I couldn’t be happier. He’s an amazing guy who has always been an inspiration to his big brother. Now the whole country will get a chance to be inspired by him as well. Once again I want to thank each and every one of you that supported Team Kortright and myself this year. You are the best of the best and we will always be grateful. Well, it’s been a long time coming, but tomorrow Team Kortright and I hit the road in the 5th Ride to Conquer Cancer. Last year the team raised just shy of $18000. This year we managed to top that slightly with the total being, as of this writing, $18,854.24. Yep, 24 cents. Not sure exactly how three of us ended up with 8 cents each (likely something to do with door receipts from the Fireworks party) but there it is. It’s wonderful that we managed to top last year’s total. I’m very proud of all the members of the team, and exceedingly grateful to everyone who supported us. There’s a couple of other things that are a little different this year. Up till now our connection to Kortright Church in Guelph has pretty much been in name only; but this year we have been granted small group status at Kortright making the connection official. It feels good because, despite what some might contend, names are important when it comes to a sense of belonging. The vast majority of Team Kortright (6 out of 7) attend KPC and we have often felt like we were in some kind of limbo; a part of the community but only at the fringes, like the weird aunt nobody really talks about. With official status as a small group we can now boldly declare our value to the community and one member of the team, Helena Watson, does that very well in this month’s issue of the Kortright Kronicles. You can read the article HERE. The other change this time around is a little more personal. In 2008 I participated in the first Ride to Conquer Cancer. Though I had done other fund-raising efforts this one really hit home. Twenty four years earlier my brother Alex had his right arm & shoulder amputated when it was discovered he had the same cancer that took Terry Fox. Not long after that colon cancer took my father from us. I have cycled all my life and when the Ride came along I knew it was the perfect way for me to be a part of the fight. Alex drove me down to the CNE grounds that first cold Saturday morning, but he was unable to join me for a number of reasons. But this year he and I will be riding together and I couldn’t be happier. His health has improved and he’s riding a great custom trike that was once the property of Dr. Robert Buckman. Dr. Buckman was a very popular oncologist at The Princess Margaret Hospital who had a reputation for making his patients feel at ease with a remarkable sense of humour. His work in educating the public on health matters and cancer in particular is legendary. If you get the chance check out the work he did with John Cleese. My Brother Alex riding the trike he acquired from Dr. Robert Buckman. The fact that my brother is riding in memory of Robert Buckman just adds to the positive feelings I have about this year’s Ride to Conquer Cancer. It’s shaping up to be the best ever. Once again thanks to everyone who has supported us, both financially and spiritually with prayers and encouragement. See you in Niagara Falls on Sunday! Me in last year's R2CC. Well, tonight I picked up my bicycle from Speed River Bicycle, where it was in having it’s yearly overhaul, and so today marks the start of my 2012 cycling season. I take it there because; a) that’s where I bought it 5 years ago, and b) they do very good work at a fairly reasonable price. I usually start riding on the weekend of the change to Daylight Saving Time (which is this weekend by the way) and ride at least until DST ends in the fall, which this year will be November 4th. Sometimes the weather will shorten the season some, but I am hoping this year it will be a long one. As I rode home after leaving downtown it took mere moments for the activity to have it’s usual affect on my system. With each passing moment I felt better and better as the cycling motion and nearly effortless motion turned back the clock. When I ride I feel 16 instead of nearly 60. Riding a bicycle just makes me feel younger. If it had been any warmer out I might have ridden further taking a more circuitous route home, but the 6 km I did ride was typical for a first time out. This is the 5th year for the Ride and in celebration of such there are a few extras going on that haven’t happened in previous years. One I’m really looking forward to is that everyone who has participated all five years will receive a special edition Golden Bike Helmet. It won’t be real gold of course but even so, it will be kinda cool. Last year there were only a little over 400 of us who had been in all 4 rides out of 4610 people. So if I get all my funding and make it into the Ride this year I will be in a fairly select group of riders. Which of course means I’m going to ask you once again to click on the banner to the left and donate to my effort in The Ride this year. If you are planning to help me with this but haven’t yet, then I would ask you to do so this month. You see there is another promotion tied to this years fundraising. During the month of March reaching certain Fundraising goals will earn you a ballot in a draw for a $1000 Voucher towards a new Norco Bike. If I raise $500 this month I get 1 ballot, $750 gets me 2, and $1000 raised between now and March 31 will get 3 ballots. No idea what the odds are, but hey! a new bike would be great and a shot is a shot right? and three shots would be even more so. Details on the promotion are HERE. So as I said, if you are intending to donate please do so this month and not only help in the fight against cancer, but help me get three shots at a brand new bike as well. Click the banner on the left or HERE to donate. That’s right, seven days from now I will be on the road riding my Trek 7100 bicycle from Toronto to Niagara Falls. Well, actually, from the C.N.E. grounds to Mohawk College the first day, then off to Table Rock Park in Niagara on Sunday. Nevertheless, there’s only a week to go and the excitement is starting to build. It will be strange this year; having been through cancer this past winter has altered my perspective. I have a small concern about my energy levels, but I know I’ll make it though it may take longer. But I’m wondering what it will be like riding as a survivor. There are people I’ve met in previous years who will remember me if they see me and it will be interesting to see how they respond when they see the yellow flag and socks sported by survivors on the ride. On the other hand seeing the hundreds of yellow flags sticking up from the crowd of 5000 riders at the starting line is a testament to the success of cancer research over the years. More and more people are surviving this terrible disease, and it’s because of research being done with dollars raised through events like the Ride to Conquer Cancer. There is a small development on the side effects front. I was told that the radiation would kill off a bunch of the hair follicles in my face rendering my beard history. However, last week I noticed when I was saving that most of them are actually functioning again! The only ones that seem to be affected are lower down in an area I usually shave anyway when I trim my beard back. So, much to Roberta’s relief, I’m growing the beard back. She never has liked me clean shaven. Getting back to the Ride to Conquer Cancer, I’m at the 80% mark in my fundraising and have such a short way to go to reach my goal of $2500 in donations. If everyone who sees clicks on the banner at right and contributes just $10 I’ll reach and surpass that goal with plenty to spare. So much in fact that if you go to my personal page and find I have reached my goal, please support one of the other members of Team Kortright is has not on my behalf. I know, I’m really pushing the donation thing, but it is only Seven Days and counting! We are integrating the needs of bicyclists in federally funded road projects. We are discouraging transportation investments that negatively affect cyclists and pedestrians. And we are encouraging investments that go beyond the minimum requirements and provide facilities for bicyclists and pedestrians of all ages and abilities. It’s an impressive list, and one I would heartily endorse. In fact I would love it if Canadian Minister of Transportation John Baird would issue a similar statement. 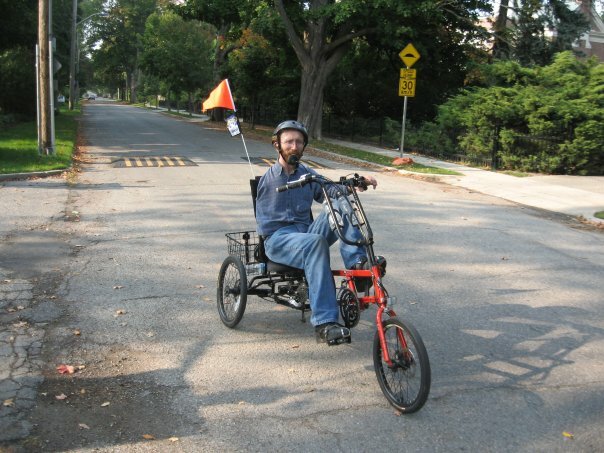 To be fair, he may well have done so, but a search of Transport Canada’s website has yet to reveal a national policy on the integration of human-powered transportation into provincial and municipal infrastructure. If anyone out there knows where to find it, please send me a link. In the meantime, if LaHood does succeed in his stated desire to end the conflict between cars, bicycles and pedestrians, it will hold out some hope for a healthier, more environmentally friendly future.